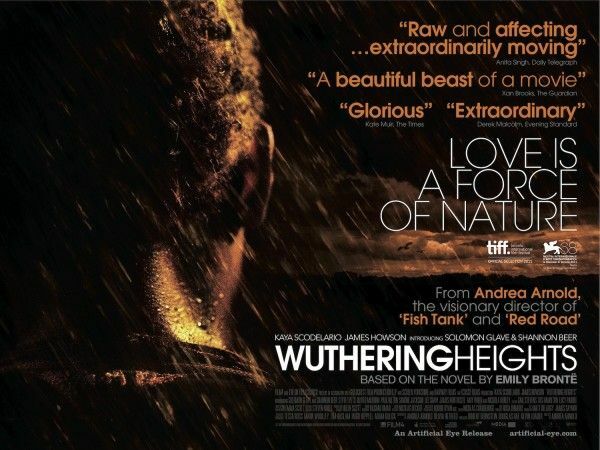 A new trailer for Fish Tank writer/director Andrea Arnold’s adaptation of the Emily Bronte classic Wuthering Heights has landed online, and it’s wildly impressive. For those unfamiliar with the source material, the story centers on the unresolved passion between Catherine Earnshaw and Heathcliff, and how their love creates a storm of vengeance. The atmosphere on display in this trailer evokes another recent (and brilliant) Bronte sister adaptation, Cary Fukunaga’s Jane Eyre, as we see a whirlwind of emotions between the leads Kaya Scodelario (Skins) and Jason Howson. Arnold’s visuals are striking (the film’s aspect ratio is an unusual 1.37:1) and the trailer is accompanied by a stellar new song from Mumford & Sons, written specifically for this film. Hit the jump to check out the trailer, and click here to check out Steve’s interview with Arnold from this year’s Sundance Film Festival. The film was released in the UK last year but finally hits the U.S. in limited release early next month. What would you do if you were denied your soulmate? The passionate tale of Heathclith and Cathy, two teenagers whose elemental love for each other creates a storm of vengeance. From Andrea Arnold, comes a new take on the classic, a startling vision of desire and obsession.